This salad doesn’t get much easier, it’ll be ready in three easy steps and demolished in minutes!! 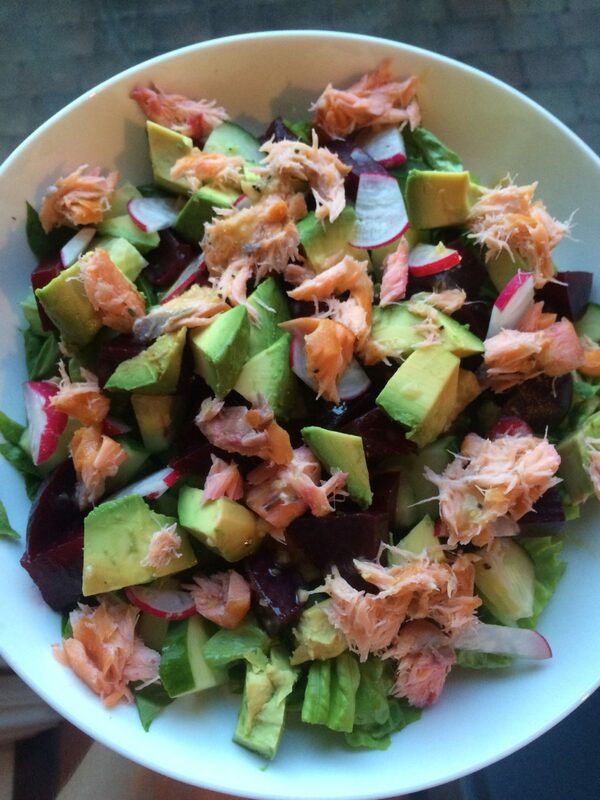 Salmon and avocado are packed full of healthy fatty acids so perfect for all diets and great for bone, muscle and heart health. This salad recipe is a firm favourite of mine and one I come back to time and time again. I often add a baked sweet potato on the side for extra fuel! Roughly chop the lettuce. Thinly slice the celery and radish. Cube the cucumber, beetroot and avocado. Gently flake the smoked salmon fillet into chunks. Divide the vegetables amongst the 2 plates, sprinkle over the salmon and drizzle with the dressing.